William Tabbernee (ed. 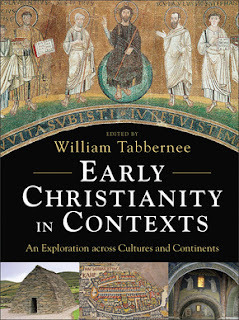 ), Early Christianity in Contexts: An Exploration across Cultures and Continents (Grand Rapids: Baker Academic, 2014). I’ve just finished reading this interesting book about Early Christianity which surveys the spread of Christianity from its origin up to around AD 1000. There is an interest in locating the particular form that Christianity took in its diverse locations, and in documenting archaeological information which evidences early Christianity. Organized according to geographical areas of the late antique world, this book examines what various regions looked like before and after the introduction of Christianity. How and when was Christianity (or a new form or expression of it) introduced into the region? How were Christian life and thought shaped by the particularities of the local setting? And how did Christianity in turn influence or reshape the local culture? The book’s careful attention to local realities adds depth and concreteness to students’ understanding of early Christianity, while its broad sweep introduces them to first-millennium precursors of today’s variegated, globalized religion. Numerous photographs, sidebars, and maps are included. The order is interesting as you get taken ‘deep into Asia’ to look at Christianity in China and India, before getting to the more familiar territory of Christian expansion in Asia Minor, Greece, Italy and Europe. No doubt it would work well as a text which supplements the more traditional approaches to church history (focused on literary texts, Greek and Latin sources, church controversies, theological development, etc.) with information drawn from realia - especially inscriptions and archaeological discoveries. But the book also works quite well as an introduction to the people and churches relevant to the production of the versions of the Bible in the languages of the missions of the churches. This is not the focus, but it is possible to get a good feel for Coptic Christianity and Gothic Christianity and so on. A knowledge of church history is pretty fundamental for textual criticism, so this book is a great help on the general background and historical and ecclesiastical contexts for the versions. Occasionally the focus of interest in inscriptions and archaeology is expressed at the expense of literary texts which are routinely distrusted (including even NT texts such as Acts and others, although individual authors have taken different views on some critical questions - from a purely NT perspective Peter Lampe’s treatment of Rome in chapter 9 was a highlight). It is a bit unfortunate that there is no concluding reflection. Obviously the diversity of early Christianity, and the explanation of that diversity in terms of different local contexts, comes through the whole book. Among the other features that come through to me was the importance of martyrdom in the whole early growth of the church, and in the specific local remembering of faithful martyrs in the construction of churches. A second interesting feature is the role of women as agents of mission, especially into the social elite at various places. A third feature is the importance of monastic centres for education and resourcing and training leaders (and although not discussed, we might add, praying). I didn’t know that quite a few recent scholars have argued that the letter of Mara bar Serapion might not be from AD70, but be a fourth century school exercise. (p. 64) Five or six items of bibliography to check out on that one for my lecture on Jesus outside the New Testament.